Russian business visa is the most sought-after type of Russian visa after the tourist visa. 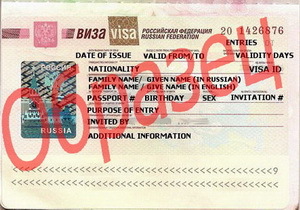 The important advantage of such a visa is permission to enter Russia valid for up to 5 years. When making such a visa it is not necessary to present proof of hotel accommodation. What is a Russian business Visa? Business visa is a document which allows you to stay for a limited period and also to cross the border multiple times. This type of visa may be used for commercial purposes, such as: signing contracts, performing technical maintenance of equipment abroad, speaking at business-related events. installation, maintenance or repair of imported equipment in Russia. 59 $ - Get online! How to obtain the Russian business visa? Read more: Why the business visa is a wiser choice than the work visa? When granted, Russian business visa (also called commercial visa to Russia) is pasted into the passport. The visa contains information about its expiration date, the number of visits allowed, the purpose of the trip, the holder's passport data and the inviting party details. How to apply for the Russian business visa? How to extend a Russian business visa? What are the common purposes of the trip to Russia? A business visa can be obtained at the consular offices of the Russian Federation. For that, it is necessary to fill in a visa application form, pay the consular fee and submit a business visa invitation letter received from Russia. If the application is made by a person who is a citizen of a high migration risk country, the Consulate officials may require a letter of guarantee from the inviting party. multiple-entry visa (commonly known as multivisa), which allows an unlimited number of times to enter the Russian Federation throughout the period of its validity. business visa to Russia for 5 years - (multiple-entry, available to citizens of the EU). According to the law, the foreign citizen's passport must be valid for at least 6 months after the Russian visa expiry date. Therefore, a visa can be issued for 5 months instead of 6, if at the time the visa is issued only 11 months are left until the expiry date. Also be aware that holders of business visa are allowed to stay on the territory of the Russian Federation no longer than 90 days within every 180-days period. Read more: How to do without a work visa to stay in Russia for 1 year or even up to 3 years continuously? If the validity or conditions of this type of visa do not suit you for some reason, please consider other types of Russian visa. How to renew a business visa? Unfortunately,extending a business visa is not a possibility. However, in some exceptional cases, such as emergency treatment or other force majeure situations, the visa can be extended. Learn more about the general principle of extension of visas: Applying for the Russian visa > How to renew Russian visa? as an accompanying family member of a citizen who has a business visa (valid for minors). In order to get a commercial visa, an invitation to Russia is necessary. Only a legal entity registered on the territory of the Russian Federation and accredited by Department of Consular Service of the Ministry of Foreign Affairs or the Federal Migration Service can apply for this type of invitation. Read more: Types of Russian invitation letters. Business invitation on letterhead of the FMS is issued by the Office of the Federal Migration Service on the basis of the application and documents submitted by the representative of the host organization. After a business visa invitation is received by the inviting party, the original must be sent to the invited foreigner by express mail service (DHL, EMS, etc.). Some consular offices accept a copy of the invitation, however the Consulate employees have the right to request the original. Permits to stay in Russia for a period of 1 month to 1 year. Citizens of high migration risk countries are advised to allow up to 30 working days for processing of this type of visa invitation. Nationals of other countries can expect to have their application considered within a period of 6 to 12 days. An invitation issued by the FMS must always be presented to the Russian Consulate in the original, i.e. it must be sent by mail. You can find the pricing information on our website. signature of the official and stamp of the FMS branch. Before issuing the invitation, the foreign citizen's personal data shall be subject to a check of the record of administrative fines, convictions or expulsions from Russia in his past visits. If such facts are discovered, the applicant will receive a written denial letter indicating the reason for the refusal and the signature of the official. Only the legal entity accredited by the FMS is entitled to send letters of invitation to foreign citizens. Such an invitation is issued on the letterhead of the inviting organization. It is essentially an application to the consular office of the Russian Federation requesting a visa for a foreign national. This method of issuing visa invitations is only available to nationals of the countries in respect to which a simplified visa policy is applied (these countries include the United States and the EU countries). Such invitations can be issued in 1 working day. The cost of this service is quite low. However, in many countries (except those commonly known as developed), the original invitation letter is required, which means it should be sent by mail. Can permit a stay in Russia for a period of 1 month to 3 years (only available to citizens of the EU, except Britain and Denmark). Processing your visa application normally takes the consular office not less than 10-12 days. During this period a screening procedure shall be performed to find out if the foreign citizen has a record of fines, convictions or deportations. The information about the inviting organization is also subject to a check. Read more: Why consider the Telex invitation or invitation issued by the FMS if I can use the invitation from an organization? Telex is a directive sent by the Russian Foreign Ministry to a consular office via internal communication channel. In this case, the foreigner does not need a printed invitation. The individual number of the invitation as well as the inviting company's details should be specified in the visa application form. The processing time for this type of visa invitation takes from 6 to 13 working days. See our affordable service rates and obtain a Telex invitation on our website. If a visa invitation is needed for foreigner who travels with a minor child, a copy of his/her birth certificate must be presented. Read more: What is the difference between Telex and original invitation?